We invite you to visit St. Mary’s Elementary School to learn more about all that we have to offer. The best way to see why St. Mary’s is the right place for your student is for you to experience our campus firsthand. 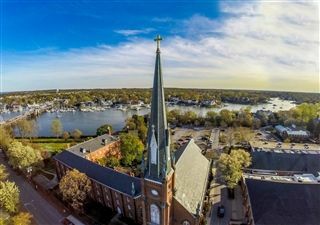 Walk around our historic campus in downtown Annapolis and you will feel the warmth and tradition that gives all of our Saints the feeling of being part of a fantastic educational experience. Witness our unparalled community of learning by scheduling a campus tour, or a guest student day for your son or daughter. I just want to say "thank you" to all the people at St. Mary's Elementary School that have had an impact on Eric since he started school there this year. On Thanksgiving after our prayer, we went around the table to say what we are thankful for. Eric said, "I am thankful for my school." We welcome you to schedule a campus visit at your convenience by contacting Marybeth Holzer, Director of Admissions at 410-990-4135 or mholzer@stmarysannapolis.org. Our experience at St. Mary's Elementary School has been amazing! Everyone has been so welcoming and truly nice. This includes the staff, the parents and the students. Eric came to St. Mary's this year not knowing anyone except who he met last year on his shadow day and few kids he had seen at his brothers baseball games. Within a few weeks of school he had made a lot of friendships. He even asked to go the high school football games to see his friends. Earlier this fall he indicated he didn't want to play basketball for St. Mary's but within a few weeks changed his mind and asked if he could because he knew so many more people since I had asked him the 3 weeks prior. Our coach is very positive and the kids are so complimentary to each other. He has so many friends and is excited to tell us about new friends that he meets. I have also had the pleasure of chaperoning at Camp Wabanna and helping with the 6th grade art project for the auction. The children are so well behaved and polite. He really likes all of his teachers who are all very nuturing. I must say that the work is challenging but it keeps Eric on his toes and he is doing well. I can't say enough about how happy we are at St. Mary's.